In a behind-the-scenes update, Google recently added nutrition info for menu items on some of the most popular restaurant chains you frequently visit. From McDonald’s or Wendy’s to TGIFriday’s or Chipotle, all you need to do is search for the restaurant name and “nutrition” on your phone (“chipotle nutrition”) and Google will give you the restaurant’s entire menu, along with listings of items and a quick calorie count. 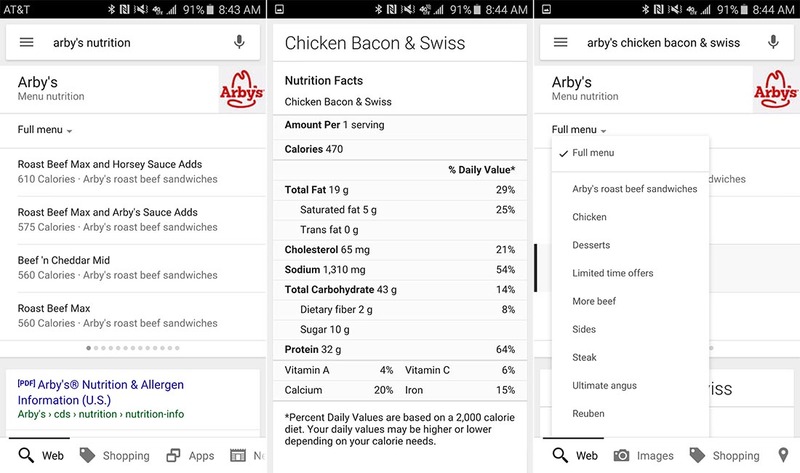 If you want to see more info, like the fat breakdown, carbohydrate count, or sodium levels, simply tap on an item and Google will load it for you below the menu. Menus can be swiped through to access additional entries or you can tap on the “Full menu” dropdown to switch menu categories. So there you have it, quick access to information that reminds you to go for a 5-mile jog, at your fingertips.